You’ve heard of the cronut. What about the rainbow bagel? The waffle taco? Or the bacon sundae? Some food trends go viral on the Internet in a matter of days. People waited in line to try the croissant-doughnut hybrid pastry in bakeries across the globe back in 2013. But can you find one now? I’m not so sure. So when Datz Dough in South Tampa announced it was going to sell a doughnut ice cream cone dessert last month, the staff there wasn’t sure it was going to take off. But it did. A doughnut ice cream cone is exactly what it sounds like: a cone made of baked dough, flavored with cinnamon and sugar. The inside of the cone is lined with chocolate ganache or Nutella. Ice cream and sweet toppings, such as whipped cream, sprinkles and a cherry, are piled on top. It was delicious. But beware: the dessert is enormous (for $10 a pop, I’d hope so) and it can be pretty messy. The doughnut ice cream cone first made an appearance at Datz Dough, 2606 S MacDill Ave., on March 24. There was a line of nearly 70 people waiting to try it. The bakery sold out of its 200-cone supply in less than two hours. By March 31, the bakery announced that the doughnut ice cream cone would become a staple on the menu, with the flavor changing every week. First it was a cone with jelly doughnut-flavored ice cream inside. This week it was Boston cream, with chocolate whipped cream, chocolate sprinkles, a chocolate-covered potato chip and a cherry on top. So why a doughnut ice cream cone? And why now? A Datz Dough employee found a photo from Instagram of a doughnut ice cream cone from a bakery in Prague, Czech Republic, a few weeks ago. The image started a text conversation among bakery staffers, and they decided to make one, said Tina Contes, Datz Dough general manager and confectionist. 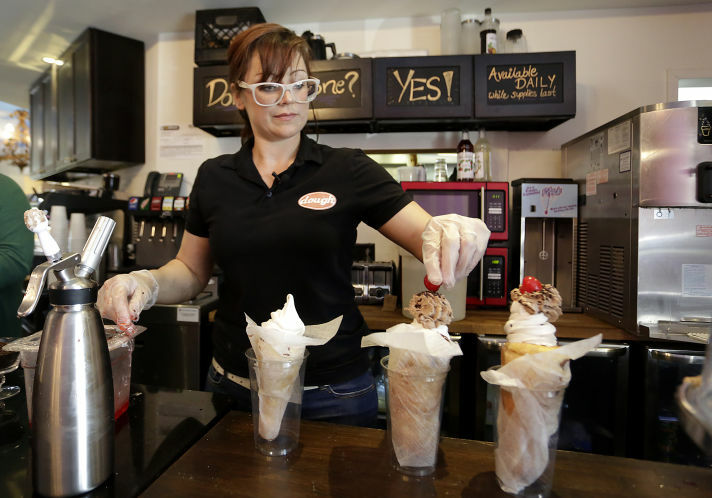 Contes and her team spent a week perfecting the doughnut ice cream cone before they decided to debut it in the store. Every night after the shop closed, they’d make another test batch. The dough couldn’t be too sweet. They needed to find a way to keep the cones from falling apart or becoming soggy as the ice cream melted. They tested the cone with different ice cream flavors. Now Datz Dough sells about 60 cones a day, said Tony Pullaro, spokesman for the bakery. “As long as customers keep ordering them, we’ll keep selling them,” he said. It’s easy to look at a doughnut ice cream cone and think this dessert is totally over the top. It is. It’s sweet, and filling, and within a matter of minutes it becomes a sticky, melted mess. But it’s just so Instagram-worthy. A group of four women ordered one each after they saw me dig into mine. I recommend it as something that’s worth trying once. After that, I’m happy to buy a standard ice cream cone. Or a doughnut. Just not the two at the same time. This entry was posted on Wednesday, April 6th, 2016 at 10:00 am and is filed under Uncategorized. You can follow any responses to this entry through the RSS 2.0 feed. You can leave a response, or trackback from your own site.